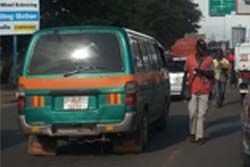 Local bus services in Lusaka and the other cities are provided by private minibuses and taxis. The buses are basic and can become very crowded. The drivers earnings are based on takings so there is a real hustle to get moving, fast, ignoring many rules of the road and blocking other minibuses to get the fares. Within towns taxis are plentiful and generally reliable but they do not all have meters so always negotiate your fare before you get in to the vehicle. If you find a good taxi take the drivers phone number, most drivers are happy to collect you from your accommodation and ferry you around. Previously all public transport vehicles were blue and white with the vehicle fleet code clearly marked on the door. This was changed in 2013, now all public transport must have a white number plate with red numbers, the vehicle fleet code clearly marked and a coloured band around the vehicle. Zambia has three main internal train lines, from Livingstone to Lusaka, Lusaka to the Copperbelt, and from Kapiri Mposhi to the Northern border with Tanzania. The main train station is in Dedan Kamathi Road in central Lusaka. Traveling by rail can be long and slow and not the most comfortable choice.